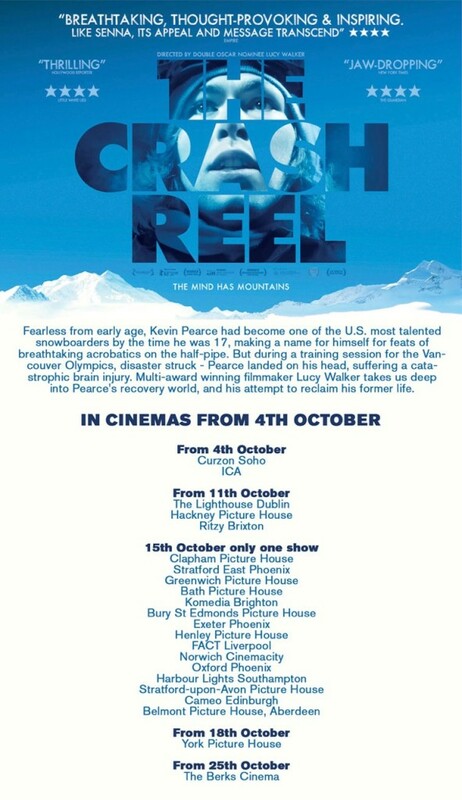 My new documentary The Crash Reel opens this Friday in the UK. I’d love you to see it. I also thought it might be useful to share some of the tactics I used when making it, in case helpful. it looks like we had multiple cameras but we had one brilliant DOP, Nick Higgins, who is a master at following verité, and myself doing the sound. I’m not the best sound recordist but I’m affordable:-) and mostly if I do it myself it saves having another stranger leaning into people’s faces when you want them to be spilling their guts out. I know I don’t’ feel like opening up when there are a few bored-looking strangers in the vicinity, and the absolute key to the success of the film, to the audience being able to engage with the people on-screen, is that ability of the people on-screen to open up. So learning to record sound well using nice simple high-quality equipment is invaluable as a documentary director. – And for that matter I have a whole slew of tricks and tips about how to get people to open up on camera, but the biggest trick of all is work with people who have that courage to open up, to let the audience walk in their shoes, feeling everything. If someone is pretending they are fine the audience won’t be able to engage. I was so lucky to work with the Pearce family who have a philosophy that if you have a disability you shouldn’t be ashamed of it, you should share it honestly and bravely and that will help everyone. That philosophy is one key reason that they are dream subjects. (And on a side note, making films that help raise awareness and bring support to people with disabilities is the greatest privilege and pleasure. Very little has brought me as much reward as working with blind people in BLINDSIGHT, and with Kevin a Traumatic Brain Injury and his brother David with Down Syndrome – or as he prefers to call it, Up Syndrome – in THE CRASH REEL). – Quality of footage is not as important as the quality of emotion, of story. Most of THE CRASH REEL was captured in glorious high quality high definition, and generally I want to always be going for the best image quality possible. However a couple of key moments were captured on lesser formats including a scene which had been shot on an iPhone and is extremely raw and powerful. It’s possibly even more emotional because it’s so real that this camera was all that was to hand in these deeply tender moments. What you need is someone shooting who understands the emotion of the scene and what to point the camera at. – Cameras are rolling all around us these days. I remember the 7/11 bombings and how the police managed to track down security cameras – and this phenomenon is suddenly strangely common, that there is so much video being shot every day that it’s possible to create films from material that was never intended to make a film. I was inspired by SENNA which used the motor racing footage, and CAPTURING THE FRIEDMANS which used home movies. For THE CRASH REEL we managed to track down 232 different archival sources, as well as shoot terrific new verité scenes. Documentary editing is an intensely creative process, and this edit is definitely the most demanding I could ever imagine as we had 19 terabytes of material to pick through, and a fascinating story to excavate, of how Kevin got to the point at which he crashed. – In documentary you never really know how it is going to turn out. You have a good idea, and you need to know that no matter what happens it will be interesting, but with this film there was really no telling where the story was going to go. It was terrifying at times, witnessing Kevin’s behaviours and wondering whether he might die because of his choices. I don’t know what the lesson here is except sometimes the luck goes your way and that things land so much more beautifully than you dared hope and thank goodness for that. We on The Crash Reel team are so grateful for the incredible material that we got to work with and the resulting film that we are so proud to share. THE CRASH REEL opens this Friday 4 October at the ICA and Curzon Soho with Dublin, Hackney, York, Berks and Brixton to follow, and 30 more cities will dedicate a night to the film on 15 October. this is super helpful. really looking fwd to seeing crash reel. good stuff. i am looking forward to experiencing the story.